Let us help your child on the fast track to success! 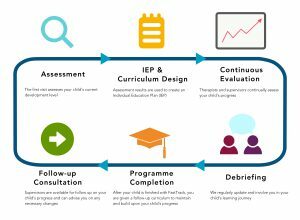 For parents who wish to give their children the greatest intensity of ABA-VB therapy possible, ARN offers the Fast-Track Programme, a centre-based high-intensity intervention programme. FastTrack is specially designed to give your child an exceptional level of direct instruction and supervision by our very best therapists or supervisors, so that he or she will achieve the greatest rate of development in the shortest period of time. The Fast-Track Programme is designed for parents who want to see their children make massive improvements in their development and/or decide whether to continue ABA-VB therapy for their children later on. The therapists and supervisors we assign to the Fast-Track Programme are the most experienced of our staff, with a minimum of 5 years’ work experience. With the cream of our crop attending personally to your child, you can be rest assured that your child is on the Fast-Track to mainstream education. The Fast-Track Programme is a whole-day programme that engages your child in therapy from 9:00am to 3:00pm, and our therapists and supervisors will also provide programming and intervention during the lunch period. The Programme is a high-intensity curriculum designed to Fast-Track your child’s transition into our regular SPEED Programme, or directly into mainstream education. Our classrooms and therapy rooms sport interior designs that mirror the look of a mainstream school setting, which is designed to help a child get familiar and comfortable with such settings. When a child undergoes the Fast-Track Programme in such an environment, it helps them become comfortable more quickly when they transition to mainstream education. The Fast-Track Programme is available in English, Mandarin and Cantonese at both of our ARN Centres in Singapore and Hong Kong. Additionally, they can be conducted in Bahasa Melayu and Bahasa Indonesia at our Singapore ARN Centre.